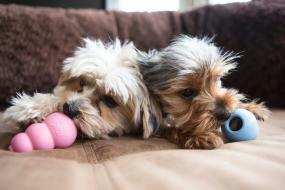 See why we think KONG dog toys are the best toys for dogs — from puppies to adult dogs. It’s not just a dog toy. It’s a KONG Puppy toy! KONG Puppy is made with an exclusive teething rubber formula designed for small and large puppies up to 9 months of age. 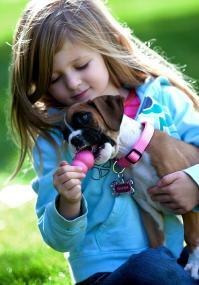 The super-bouncy, pink or blue natural rubber compound is unequaled for puppies who like to chew. Veterinarians and dog trainers recommend stuffing the KONG Puppy toys with healthy treats to aid in crate training, decreasing separation anxiety, promoting proper chewing behavior, and deterring bad behavior. Want a happy, healthy puppy? Try a KONG Puppy toy! One of the biggest reasons to introduce KONG Puppy toys to your new dog is to reduce unwanted chewing. Since puppies love to chew, it’s important to teach your dog which items are acceptable to chew on. Teach this lesson in a positive and fun way by introducing a KONG Puppy toy stuffed with dog treats. You can use a variety of KONG toys and treats to keep these puppy chewing lessons fun and interesting. Always monitor what your puppy is chewing on. Be consistent by saying NO when your dog chews on the wrong things, and giving praise when your dog chews on the appropriate puppy toys. Like humans, dogs have 2 sets of teeth in their lives. The 28 baby teeth erupt through the gums between the 3rd and 6th weeks of age. Puppies don’t have to grind much food, so they don’t have molars. Puppy teeth begin to shed and be replaced by permanent adult teeth at about 4 to 5 months of age. The teething period can be frustrating and painful. A teething puppy clamps their mouth on everything they can reach — from body parts to expensive sneakers — in an attempt to relieve the discomfort. KONG puppy toys are gentle for growing teeth and jaws. They help to promote entry of incoming teeth, while establishing healthy chewing habits.